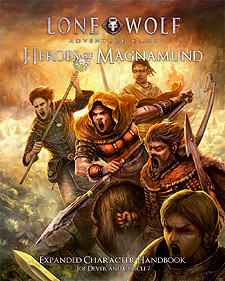 Heroes of Magnamund: Expanded Character Handbook brings a wealth of additional player options to The Lone Wolf Adventure Game. Take your adventure beyond the Kai Order with a huge array of new options that let you play any Magnamund character you want to. An expanded guide to character creation, with new traits, skills and abilities. Roles offer the chance to take up the mantle of famous character types, from Noodnic Scavengers of Durenor and Magicians of Dessi to Buccaneers of Shadai and many more favourites from the Lone Wolf gamebooks. Archetypes allow you to create a unique character of your own, starting with templates including Adept, Scoundrel, Soldier, Wanderer and more. Equipment for all the specialist roles and archeytpes, including Bor muskets, cutlasses and the deadly Shiel-fa. Assemble your party and venture forth. Become Heroes of Magnamund!